In 2005, Dr Tom Calma called on the nation to address the appalling 17 year life expectancy gap between Aboriginal and Torres Strait Islander people and other Australians within a generation through a human rights based approach. 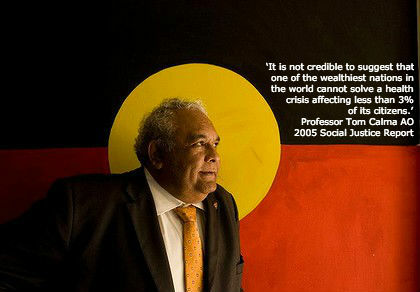 In his 2005 Social Justice Report, the then Aboriginal and Torres Strait Islander Social Justice Commissioner Professor Tom Calma reported the unacceptable 17-year life expectancy gap between Aboriginal and Torres Strait Islander people and other Australians and set the challenge to close this gap by 2030 through a human rights based approach to health. A coalition of Aboriginal and Torres Strait Islander health peak bodies and leaders, mainstream national health organisations and human rights organisations launched the Close the Gap campaign to close the health and life expectancy gap between Aboriginal and Torres Strait Islander peoples and other Australians within a generation. We called for a National Aboriginal and Torres Strait Islander health plan with ambitious yet realistic targets supported by a partnership between government and Aboriginal and Torres Strait Islander peoples. halve the gap in employment outcomes between Indigenous and non-Indigenous Australians within a decade (by 2018). The Close the Gap campaign continues to hold the the governments of Australia to account on achieving these targets and advocating for increased efforts in order to achieve health equality within a generation. Closing the Aboriginal and Torres Strait Islander life expectancy gap is everyone's business: it is a national issue in which every individual, organisation and group in Australia can play a role. In the last ten years the Close the Gap campaign for Indigenous Health Equality has transformed the social and political landscape around Aboriginal and Torres Strait Islander health in Australia. Hundreds of thousands of Australians have raised concern and called for action on this important issue. These efforts have put Aboriginal and Torres Strait Islander health equality at the centre of the political agenda and has kept it there for many years. While we’ve seen some promising steps forward in the past 10 years, the Strategy and 2030 targets have been effectively abandoned with more than $530 million cut from the Indigenous Affairs portfolio. In order to Close the Gap government needs to renew their commitment and investment in Aboriginal and Torres Strait Islander health, provide long term funding, and properly fund the Aboriginal and Torres Strait Islander Community Controlled Health Sector and health workforce. Aboriginal and Torres Strait Islander peoples still live, on average 10 - 11 years less than non-Indigenous Australians. Disease rates are more prevalent and death rates higher. In 2018 First Peoples are also still more likely to be at risk for, and die from cardiovascular disease, diabetes and kidney disease. There remains the need for tremendous effort and resources if we are to Close this Gap by 2030. 'Refresh' the Closing the Gap Strategy - This requires a renewed negotiation process consisting of Aboriginal and Torres Strait Islander health leaders, Federal and State and Territory governments and community consoltations . Furthermore Australian governments must be accountable to Aboriginal and Torres Stait Islander people for its effective implementation. Australian governments need to rejuvenate their appraoch to addressing health equality. Their renewed commitmment would include: a renewd national agreement, Federal leadership and national funding agreements that designate clear accoutnability for implementation. Maintain and expand elements of the current Strategy, such as: maternal and infant health programs and chronic disease; while also addressing the social determinants of health. Current Closing the Gap health targets are maintained complemented by targets which report on the original targets. These measures should be agreed on by Aboriginal and Torres Strait Islander health leaders and Australian governments. Fully refunding of the National Aboriginal and Torres Strait Islander Health Plan Implementation Plan by the Federal government. The creation of an overarching health infastructure and housing plan for Aboriginal and Torres Strait Islander Peoples to support the attainment of health equality by 2030. Be part of the generation that closes this gap forever take action below. Adding your address identifies your electorate, increases the impact of your letter and makes it more likely that you will receive a written response. The Close the Gap Campaign has welcomed the COAG agreement to work in genuine partnership with Aboriginal and Torres Strait Islander peoples on the Refreshed Closing the Gap Strategy. COAG has recognised that in order to effect real change, governments must work collaboratively and in genuine, formal partnership with Aboriginal and Torres Strait Islander peoples as they are the essential agents of change. Read more in the Close the Gap Campaign Co-Chair's media release. of the Uluru Statement and its promise of a better future. Today ANTaR reflects on the 10th Anniversary of the National Apology to the Stolen Generations. The Campaign Steering Committee welcomes the absolute gains in Aboriginal and Torres Strait Islander life expectancy from 2005–2007 to 2010–2012. Over that five-year period, life expectancy is estimated to have increased by 1.6 years for males and by 0.6 of a year for females. But a life expectancy gap of around ten years remains for Aboriginal and Torres Strait Islander people when compared with non-Indigenous people. Continued comittment and ensuring Aboriginal and Torres Strait Islander health equality is a priority is required if we are to Close the Gap by 2030. Success Stories in Indigenous Health - A showcase of successful Aboriginal and Torres Strait Islander health projects was released in 2007, in the early days of the Close the Gap campaign, to demonstrate that positive change was possible in the area of Aboriginal and Torres Strait Islander health. Warren Mundine delivers The Baker IDI Central Australia Oration on 4th October 2013 in Alice Springs.